Laptop batteries are expensive. On the other hand SLAs (VRLAs) aren't. Now of course SLAs are big, and heavy, while LiIon laptop batteries are small and light, but sometimes that isn't the decisive factor. I have an old laptop with a near-dead battery. It wasn't worth buying a new one for it, but I would've liked some mobility. Since the laptop itself is big and heavy having a big and heavy battery isn't the drawback it would be for a netbook and since our bush trimmer's SLA sits unused 90% of the year (except for the 5 and half times it's used and the occasional top-up charges) I thought I'd use it for something. 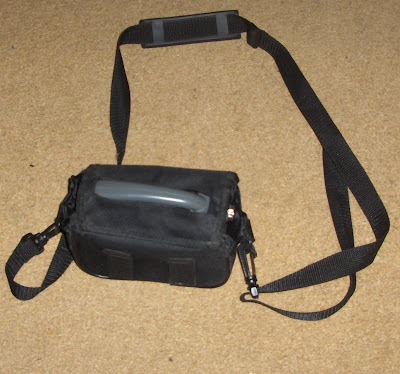 It also came in a nice plastic case with a shoulder strap, for easy carrying so it was ideal for this application. The laptop had a 14.8V LiIon battery pack, unloaded it measured some 16.6ish Volts, loaded it drops to 14.5-14.8 as rated. Now the SLA even if fully charged won't be more than 13.8 Volts unloaded. As expected, it wasn't enough to run the lappy, so I had to come up with a solution to boost the SLA's output voltage to 14.8ish volts. First I measured the current such a solution would have to provide. My lappy's top load was at around 4.2A for a few seconds during boot and has an average idle load of around 1.5A so I concluded that I'd build a boost conveter that can supply close to 5Amps. First I went to look at Maxim's lineup, since I've come to like some of the power regulator chips, and noticed the MAX668/669, which I went ahead and free-sampled. Their power supply cookbook was great help in the design. I based mine off CB115. Pretty much all of the components I used are different because the values they used are not standard in the EU at least, so I couldn't get components that mached, except for a couple of resistors. I also opted to use components I had lying around as-is common in DIY projects. 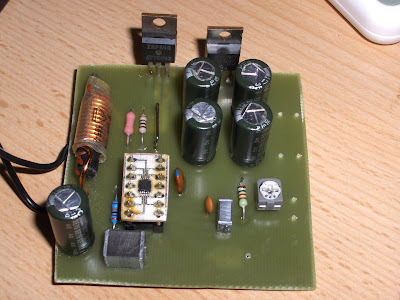 The inductor is a large 5uH/10A inductor with 3 turns unwound and cut to get something close to 4uH, I used a couple of metallized polyester caps in place of ceramics. The 1uF one turned out to be one of those because no local parts shops stock ceramics >= 1uF.. The FET is an IRF840, and the diode is a HFA15TB60. I went all through-hole for this project, and the previous uMAX->DIP converter was indeed used for the MAX668s. This is possibly not ideal for a PWM boost converter, but the fact of the matter is, it worked beautifully. Had a small project box that I've decided to use for this. I replaced the back plate with a heatsink and screwed the FET and Diode on there. It's definitely overcooled, but what the heck. The perhaps most interesting picture came out the worst (my camera is useless in low light), so you'll have to excuse me for this below. 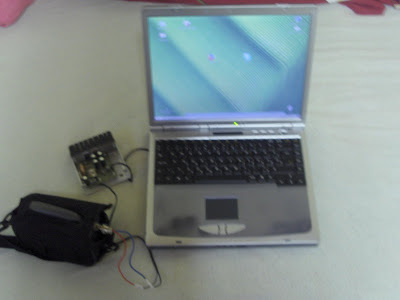 It shows the battery hooked up to the boost converter hooked up to the lappy, which is up and running. Running Linux nonetheless. I'll probably make a video when I'm done with the battery protection and the case. Of course I lose voltage monitoring in software with this solution, but not sure if it would really make much difference because the MAX668 tries to compensate for declining input voltage and and keep the output voltage constant. The further away the input voltage is from the output, the less current it can supply however (which might be accompanied by voltage drop but I haven't measured this). Either way when the battery nears 10.6V loaded voltage (complete discharge), the backlight inverter is the first to drop out. I'm going to go ahead and get the most obvious questions out of the way. Is this practical for the average laptop user? Where is this hooked up? To the battery pin header in the above Clevo laptop's battery compartment. Can this somehow be modified to act as a charger instead? It might. The output voltage can be adjusted with a potentiometer. I'm pretty sure it can go to at least 20V, but possibly more, which is my laptop charger's output voltage. Not sure about the constant current draw on a charger though but I'm fairly sure it couldn't supply 20V/4A from an SLA. Not without a separate power filter and regulator (like ->this<-), car power is noisy, with possible large fluctuations in voltage. I suspect the first spike would fry this converter if hooked up directly. I tested the PSU from the 3AH bush trimmer SLA. The results were pretty underwhelming, at 30 minutes run-time (under heavy use). I decided to add the 2 extra caps for good measure, and tried playing around with the output voltage. The higher the output voltage is the less run-time I can get out of the battery. So I'm going to try and lower it and find the lowest voltage the laptop still runs at, to maximize battery time. I've also read that small SLAs don't like constant heavy load (though I'm not sure what they consider to be heavy). But the SLA itself might not be in the greatest shape either. And there's always the fact that as input voltage declines so does the amount of power the PSU can deliver. Sadly, at 11.4V (which is considered to be the SLA's full discharge voltage by some, while others say it's around 10.6) it reaches a point where the backlight inverter drops out. Now of course the input voltage may have been lower at the point where the inverter dropped out (closer to 10.6) and could have just "jumped" back to 11.4 when the inverter's load disappeared, but sadly I don't have a DMM I could do constant monitoring and logging with. I've also come to the realization that a battery overdischarge protection circuit and relay will never fit in the current case, so I've decided to leave those out. The laptop will turn off before the converter has a chance to overdischarge the battery, and it only uses a really small amount of power if no load is connected to it, so at this point I'd probably have to leave it on for a day or two for it do any damage to the battery. 30 minutes of use? really? that doesn't seem right at all...!?!? Well there are various factors involved here. Those that I mention in the blog entry and the fact that this is a power hog laptop with a desktop CPU and 0 advanced power management features. Also I was testing with linux, which is said to be less battery efficient than other operating system, and CPU usage never really went below 50%. The original LiIon battery of this laptop is 4.4Ah, it lasts an hour and a half with regular use when new. The worn out 3Ah SLA lasted half an hour under relatively heavy load. I guess that's the way it goes. I'll have to try and fine-tune it, and test with a bigger/better condition battery. Its under standable that he can't get more than 30 min on a full load. Wait could you take 10 double a's in series to get 15 volts at 2.4 amps with the exception of the discharge limitations you could power your laptop the same amount of time that you use your SLA? The boot up discharge would definitely be a problem. Thanks mate, now i'm definitely going to make MAX668 based laptop charger for my car. If you have some in your parts bin and have time to kill go for it. Nowadays I'd just get something like this: http://www.ebay.com/itm/262634176599 myself. 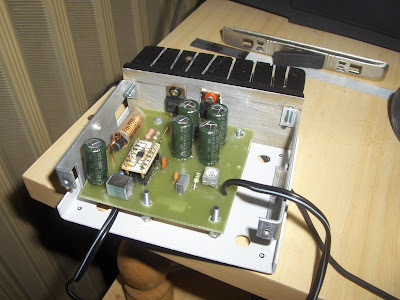 Most of the power supply stuff I've built was unavailable or expensive at the time but is available for a few bucks from China these days.